Germany has measures on the books to close all of the country's nuclear reactors by 2022. Although a majority of people in Germany oppose nuclear power, there are conflicting views on just how to phase it out entirely. The movement to pull away from nuclear energy has been a main talking point for politicians in recent elections. Now, with the plan in motion to take all of Germany's nuclear reactors offline, politicians and voters alike are concerned about what comes next - and who will end up paying for it. Phasing out all nuclear power plants is one of the prongs of Germany's Energiewende, or energy transition, policy to curb its carbon emissions and transition to renewable energy. The movement to pull the plug on Germany's nuclear plants, however, started decades before Chancellor Angela Merkel made the call to immediately close several reactors following the Fukushima disaster in Japan. Germany began using nuclear energy commercially in the 1960s, but a strong anti-nuclear movement formed in the early 1970s with local groups organizing protests against the construction of new plants. Following the Three Mile Island accident in the United States, hundreds of thousands of people took to the streets in the German cities of Bonn, then the West German capital, and Hannover in 1979 to demand that all nuclear plants be shuttered. Large public protests against nuclear power and waste transportation took place throughout the 1980s and 1990s, with the anti-nuclear sentiment becoming one of the main reasons for the emergence of the Green party in 1980. For decades, protesters in Germany rallied under the slogan "Nuclear energy? No, thanks"
In 2002, the Social Democrats (SPD) and Green party government, led by then-Chancellor Gerhard Schröder, enacted a law to phase out nuclear energy after negotiating with nuclear power plant operators. After coming into power, Merkel's government - in a coalition with the business-friendly Free Democrats (FDP) - announced plans to reverse the law in 2010. The changes intended to extend the operating times at nuclear plants by eight to 14 years. The nuclear disaster in Fukushima, Japan, in March 2011 signified a major shift in Germany's attitude towards nuclear power. In March of that year, the Fukushima plant suffered three nuclear meltdowns after being hit by a tsunami caused by an earthquake. A few days after an earthquake and tsunami, over 40,000 protesters in Germany formed a 45-kilometer (28-mile) human chain from the city of Stuttgart to a nearby nuclear plant to demonstrate against the government's plans to extend the life of Germany's nuclear power plants. A few months later, Merkel did a complete about-face on nuclear energy. On June 30, 2011, Berlin ordered the immediate shutdown of eight of the country's 17 reactors. The decision also outlined a timeline for taking the rest of the nuclear plants offline by 2022. Over 80 percent of parliamentarians in the Bundestag passed the nuclear phase-out plan. Only the Left party voted against the measure, saying they wanted a faster timeline. Although the move was widely supported by both politicians and voters alike, the companies who own the power plants pushed back against the government with multiple lawsuits over lost profits from the immediate shutdown of plants. Germany's top court recently ruled that a government tax on spent nuclear fuel rods is illegal, enabling utility companies to claim back billions of euros. The debate around who will pay the final bills also remains contentious, with companies hoping to pass costs along to the state, posing a financial risk to the government and taxpayers. Questions also remain open concerning where the spent fuel rods and other leftover radioactive material will be stored. Many are worried that certain storage sites could lead to radioactive waste seeping into the groundwater. Nuclear energy - An error or the future? Nuclear power worldwide - An error or the future? 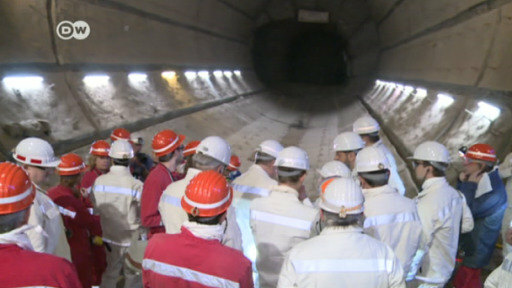 In Germany, it's becoming clear that the country has a big problem with nuclear waste. One example is a former salt mine in Lower Saxony, where low-grade radioactive waste has been stored for decades.